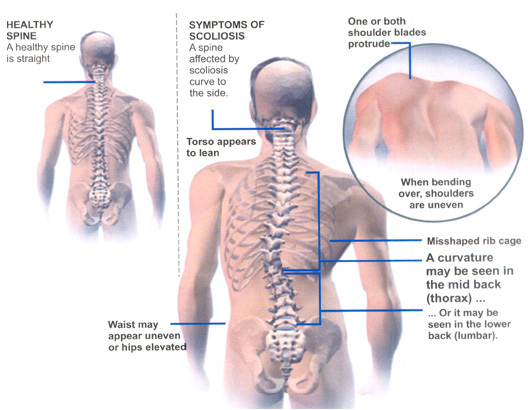 The First Part, Which You can Read HERE, Defined What Scoliosis is. This Second Part, Will Discuss What the Symptoms of Scoliosis are, Followed by, The Third Part, That Will Discuss What You Can Do About Your Scoliosis, which Will Be Posted Sometime Next Week, and Then the Final Fourth Part, That Will Discuss What the Treatment Options for Scoliosis are The Following Week After That. Most of the time Scoliosis Does Not Cause Pain in Children or Teens. Pain in a Child or Teen who has Scoliosis may be a Sign of Another Problem. If Your Child has Pain in Addition to a Scoliosis, it is important that They see Their Health Care Provider to find out exactly What is Causing the Pain. If You are an Adult with Scoliosis You May or May Not Have Back Pain and if Back Pain is Present, it is difficult to know whether Your Scoliosis is the Cause of the Pain, so again, see Your Health Care Provider to Find Out Exactly if Your Scoliosis or Something else is Causing Your Pain. Are Your Shoulders Different Heights or is One Shoulder Blade More Noticeable than the Other? Is Your Head Centered Directly Over Your Waist? Does One Hip Appear to be Higher or More Prominent then the Other? Do Your Ribs Appear to be at Different Heights? Do You Have an Uneven Waist? Do You Have Any Changes in the Look of Your Skin over Your Spine such as: Dimples, Hairy Patches, or any Color Changes? Do You Lean Your Entire Body to One Side? If You Notice Any of the Above 7 Signs see Your Health Care Provider to Get a Full Evaluation. If He or She Suspects You Have a Scoliosis, Spinal X-rays will then be taken to Confirm if You Have a Scoliosis and the Curve will also then be Measured to Determine the Severity and What Your of Treatment Options are. Next week I will discuss What Can You Do About Your Scoliosis. So You Don’t Miss the rest of this Series or any Future Posts, just Subscribe to the Email Updates HERE. Or You can Subscribe to the RSS Feed HERE (See: What’s This? ).